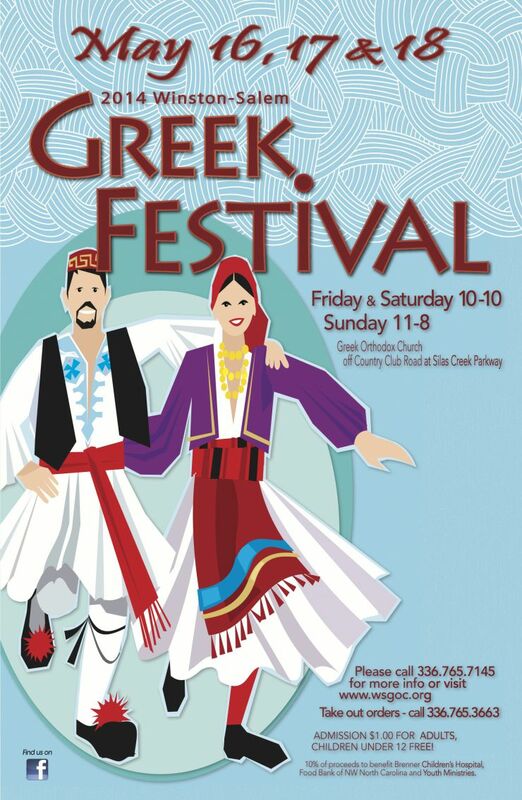 Greek Festival 2014 Festival Starts today! | Whats Happening? Greek Festival 2014 Festival Starts today! On May 16, 17 and 18, the Greek community is inviting everyone to its Annual Greek Festival at the Greek Orthodox Church. 435 Keating Drive, off of Country Club Road & Silas Creek Parkway. Here’s what’s on tap for the weekend: plenty of Greek dancing, informative tours of the beautiful church, and shopping at the Agora (Market Place), where you can purchase arts, crafts and other goodies. Speaking of goodies, the most important part of the festival in my opinion, is the F-O-O-D. And lots of it! Think: Gyros, moussaka, pastitsio, souvlaki and my favorite, spanakopita! The festival hours on Friday and Saturday: 10 a.m. to 10 p.m. Sunday, 11 a.m. to 8 p.m. Admission is $1.00. You can also call in take-out orders from the event. Telephone: 765-FOOD (3663).